On January 30th, it was once again time to move. 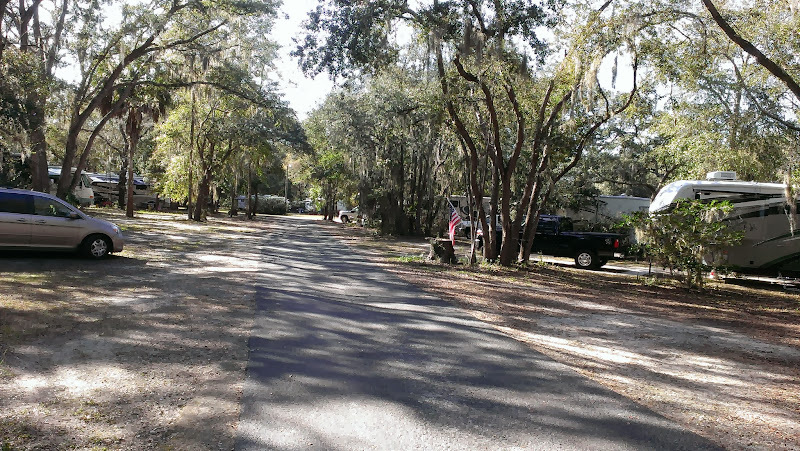 Alafia is a great state park and we hope to return someday for a longer stay so we can explore it further. Our recent drives have averaged less than an hour, but on this day we had a “long” 2 hour drive ahead of us. Not really long at all but longer compared to our recent short hops. It was a rainy, cold, and raw day making getting ready to leave not much fun. 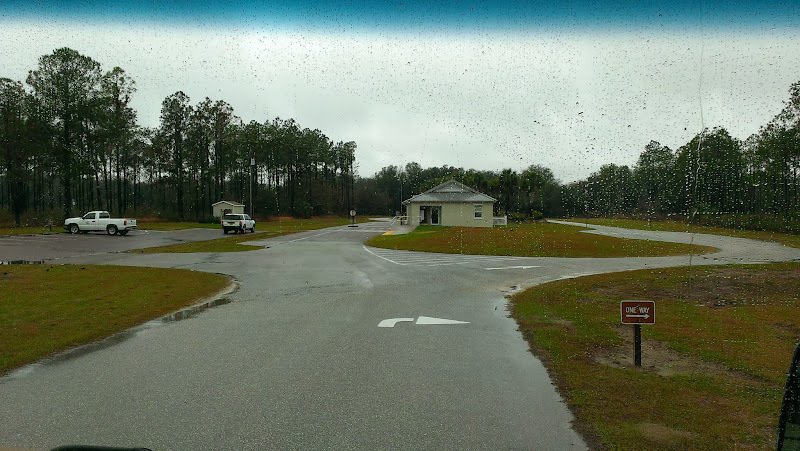 Departing around 10:30 am, we headed out of the state park towards our next destination, Rock Crusher Canyon RV Resort in Crystal River. Funny how sometimes your memory lets you down. 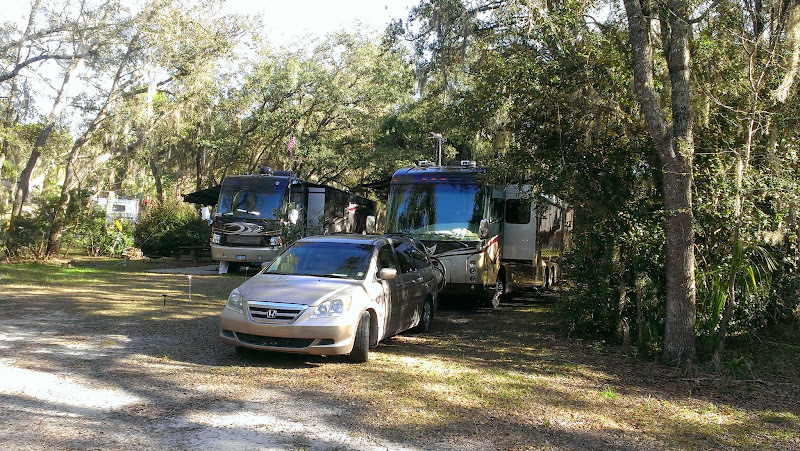 Back in 2011 during our first winter trip south in our Discovery (before we began blogging), we met up with Rob’s aunt & uncle, Linda and Herb in Homosassa Springs on the Gulf Coast of Florida where we stayed at Carefree’s Turtle Creek “Resort” (now called Homosassa River RV resort). The term “resort” is very questionable in this case but it sure was cheap – the weekly rate then was only $99. Turtle Creek was an older park with 225 sites that had been bought by Carefree Resorts just prior to our March 2011 visit. 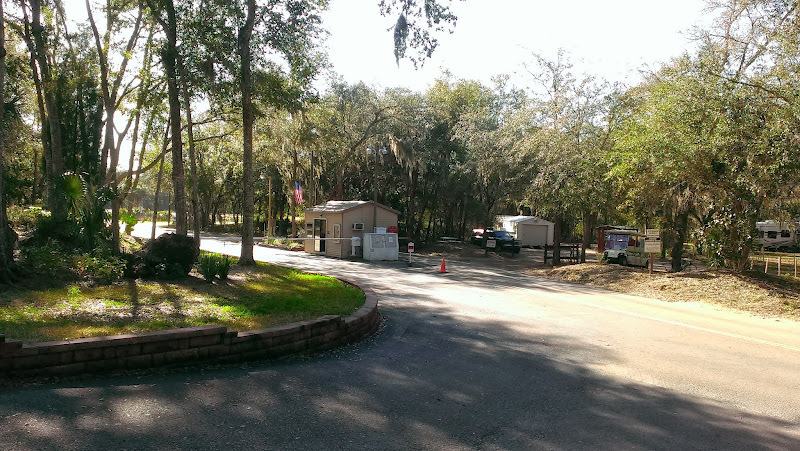 Turtle Creek was (and still is) comprised of a number of “long term camping units” of assorted varieties (many complete with the usual shoddy looking add-on accoutrements) mixed in with transient RV’ers in more up to date and modern equipment. We took a ride back thru on this trip and although there are some changes, it still looks pretty much the same as it did in 2011. Despite being a little disappointed with Turtle Creek back in 2011, we had a great time, even renting a pontoon boat for a day so the four of us could explore the Gulf waters and hang out with the many manatees that live in the consistently warm waters of the head springs. That was so cool! 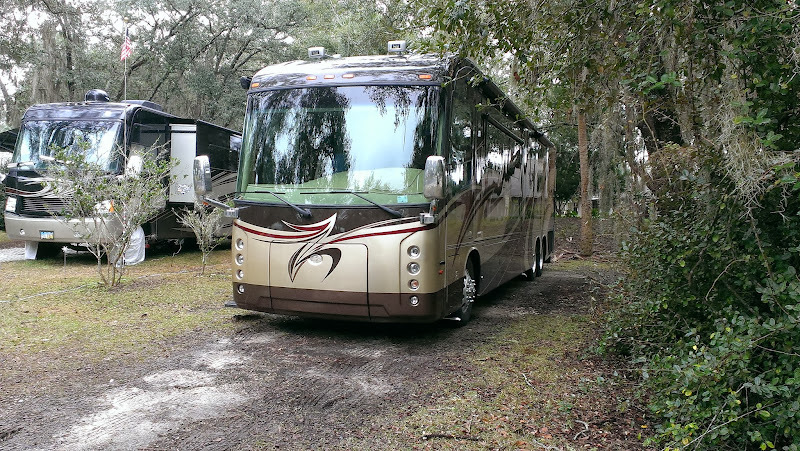 Anyway, I digressed….during our stay in 2011, we checked out a few other campgrounds in the area, one of them being Rock Crusher Canyon RV Resort. 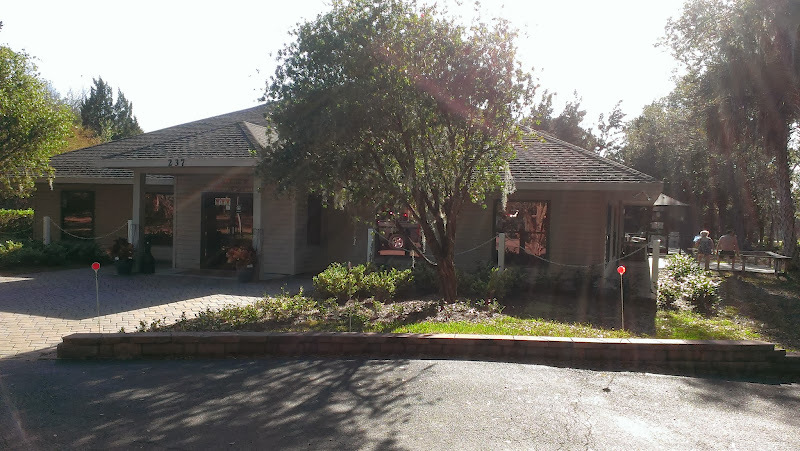 Advertising a lot of amenities – 226 sites, beautiful modern clubhouse, large screened in seasonally heated pool, jacuzzi, horseshoes, shuffleboard, free wifi, cable, and laundry facilities, it seems to be pretty popular. Lots of activities too which are broadcast on their Facebook page. 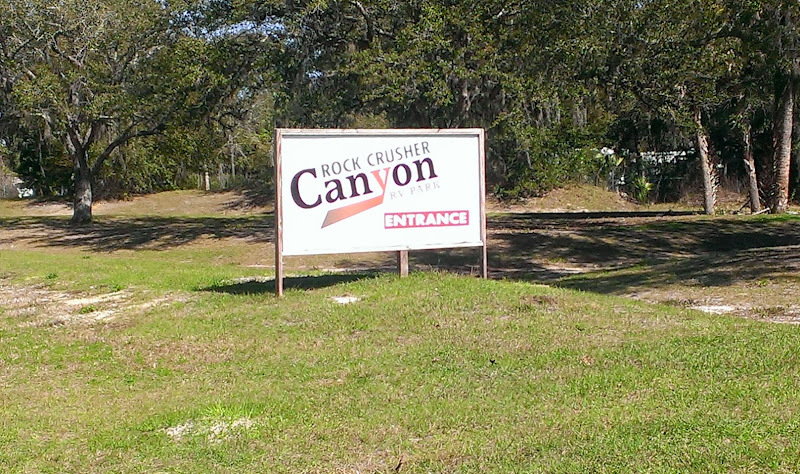 Plus in addition to the campground, there is the Rock Crusher Canyon Amphitheater & Pavilion which is located nearby. The Amphitheater is constructed in an old rock quarry. The 20,000 square foot open air Pavilion has been the stage for many concerts, hosting such entertainers as Tim McGraw, Glen Campbell, Willie Nelson, Faith Hill and many others. Maybe it was because we were comparing Rock Crusher to Turtle Creek back in 2011 that it seemed very nice or maybe because it was sunny, not really sure why we had such a favorable impression but when we arrived on Thursday we were a little disappointed. Huh, this wasn’t how we remembered it! After checking in at the office, we were assigned to Site #3 which was just a short distance from the entrance. Although our site was fairly long and an easy back in, it was pretty close to our next door neighbor. No cement pad here – just dirt, very muddy due to the rain and surrounded by heavy tree cover to the south and west so we instantly knew that getting satellite was out of the question. Plus it was very close to the entrance and we were concerned about all the traffic and noise all day long (that concern turned out to be mostly unfounded). Before we settled in, we decided to hop into the van and take a tour to see if there were any other available sites that might be more suitable and had fewer trees. The roads here, although paved, are fairly narrow and many of the sites are not level. After finding several open sites, we went back to the office. Unfortunately none of the sites we liked were available but we were given 4 other sites to check out. Forget it – they had just as many trees, were not level or would not be easy to back into so we decided to stay put. As anticipated, we couldn’t pick up any satellites so Rob tried the OTA antenna – nope, no signal there either – zero, no broadcast towers within range. Oh no, would we have to spend a week here without TV, perhaps having to talk to each other and eat dinner without watching Jeopardy and missing the Super Bowl commercials??? Rob finally hooked up to the campground cable and lo and behold we could get all the locals as well as some of the basic cable channels, some even in HD. Of course, we wouldn’t be able to time-shift (record) anything. Oh well, that’s inconvenient when you are used to that capability but I guess we could suffer through it. 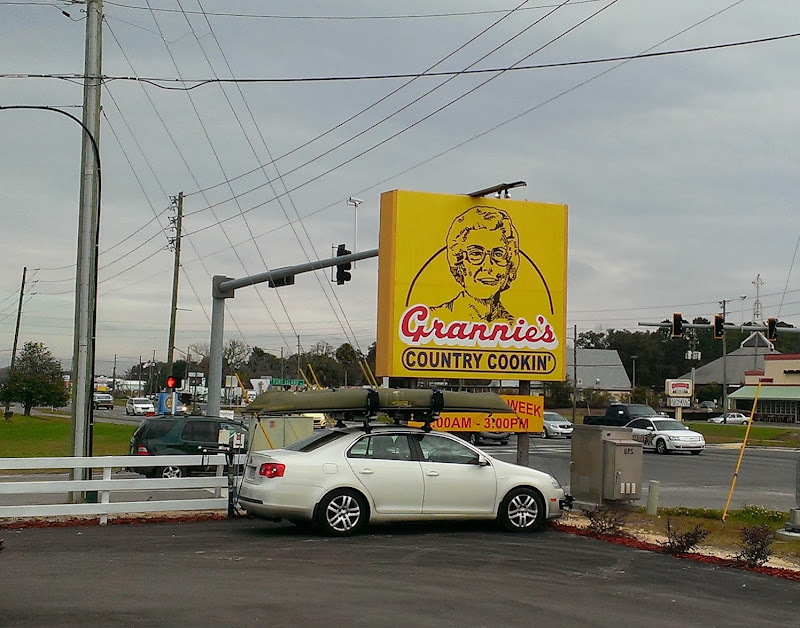 The next day, Friday, we decided to do our usual breakfast run, heading towards Granny’s, a restaurant we had gone to in 2011 and then to Wal-Mart for a few items. 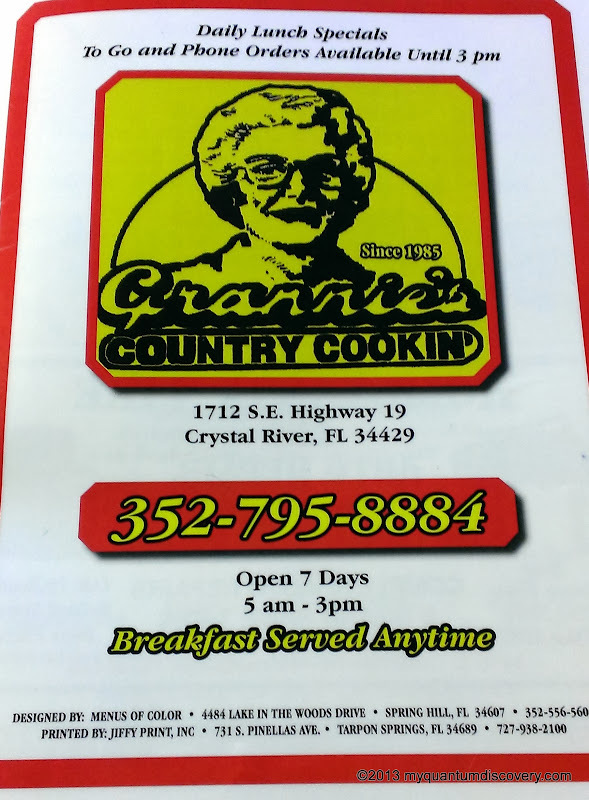 Since Crystal River and nearby Homosassa has a lot of retails stores, there is a lot of traffic along the main drag, another thing we had forgotten. At Grannie’s, we both had a bacon and cheese omelet with hash browns and toast. Food was good, service was excellent and the prices were reasonable. After breakfast and our stop at Wal-Mart we headed back to the coach. Rob had planned on setting up the portable satellite dish so he went outside to start scoping out where to put it. It didn’t take long for the older gentleman in the coach next to us to come out and start chatting. I was inside busily making lasagna so I didn’t hear the conversation but Rob was telling me that according to our neighbor (a season long tenant from Ohio that has been coming here for many years), Rock Crusher has changed hands a few times over the past 5 years. The original owners sold it to a couple who planned to turn it into an ownership resort (we had seen several sites that had brick pads/driveways) but it never took off and they couldn’t make their balloon payment, so the original owner repossessed it and that is how it stands today. Not sure what happened to the few people who “bought” sites, but there are certainly quite a few folks that love it here and think it’s a great place to be. Anyway, after awhile, it started to rain so Rob came inside, deciding to wait until the next day to set up the portable satellite dish. Earlier in the day before we went out to breakfast, Rob had complained that he didn’t feel quite right. Within an hour of coming inside, it hit. The “it” we think was a severe case of gastroenteritis, otherwise known as the norovirus. Since you’ve probably heard about the nasty symptoms on several of the cruises lately, I won’t go into any gory details but he was so sick, praying to the toilet gods all night long. Of course, I didn’t get much sleep either since I was very worried about him. Finally by Saturday morning things had subsided a bit, although he did have a temp over 100 degrees, but at least he was finally able to get some sleep. By Sunday morning, his temp was normal and he felt much better but was still under the weather. At least he felt well enough to eat something. So far I haven’t come down with it….keeping my fingers crossed! Needless to say, Sunday was a quiet day, mostly watching all the Super Bowl hoopla on TV all afternoon. Not a Seahawks fan but boy, did they play well. Felt kind of bad for the Broncos, at least they did score so it wasn’t a total shutout. Before the game, I said to Rob that I was almost glad the Pats weren’t playing – much less stressful when you don’t have a strong emotional investment in the teams playing. BTW, our neighbor from Ohio had heavily invested in “decorative” LED lighting for his site. We had all manner of miniature solar panels, runway lights shaped like little stars, under-coach rope lights, above-coach rope lights, etc. Even a flagpole complete with alternating RGB colors running its full vertical height (~15′). Even with everything closed up tight on our rig at night, the blue, green and red glow creeping behind the edges of our privacy shades made us feel like we were parked next to a nuclear waste dump. Geez! Good thing most of this stuff was LED based otherwise I think we might have had some power quality issues! Monday the sun came out and Rob felt better but was still feeling the aftermath so we took a short walk around the campground, then sat outside for awhile making for another quiet but pleasant day. Even the kitties enjoyed a few minutes outside. Funny how a little sprinkling of sunshine can change the appearance of a place – the park looked so much better against a sunny bright blue sky than it did the wet, dank and dismal day we arrived. It totally changed our initial impression – of course the trees were still here, the satellite and OTA reception was still nonexistent (we decided that Rob wouldn’t bother with the portable satellite) and there was a little noise from the traffic at the entrance but somehow it all seemed better. Plus it was no longer muddy! Even the Las Vegas like glow from next door seemed less annoying and a bit more festive. When we woke up on Tuesday, it was very foggy but once the fog cleared it was supposed to be sunny and in the high 70’s. Rob felt better so we decided to go to the Ellie Schiller Wildlife Park. More on this in a separate post.